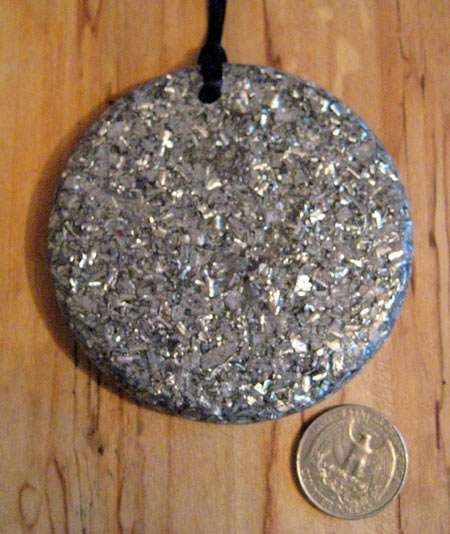 Orgite pendants are great if you want to clear your body's energy field. It will also strengthen your aura and make you more resilient to outside negative influences. Orgite pendants are a great way to strengthen your overall body energy. A string for the necklace is included and can be tied to the length you want. 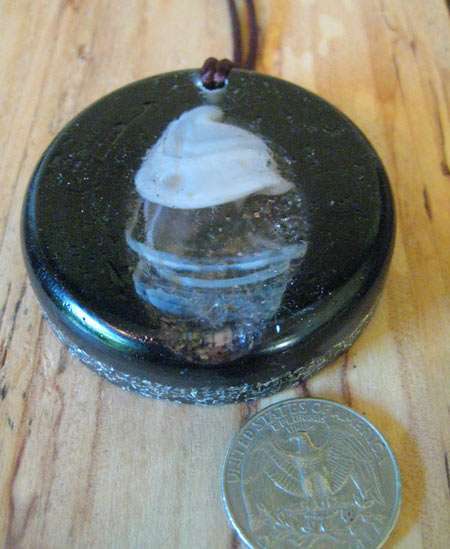 The following pendants have a top layer of tourmaline powder, with orgone metal shavings and/or powder underneath. Tourmaline is well known to be strongly protective. All have a crystal inside. 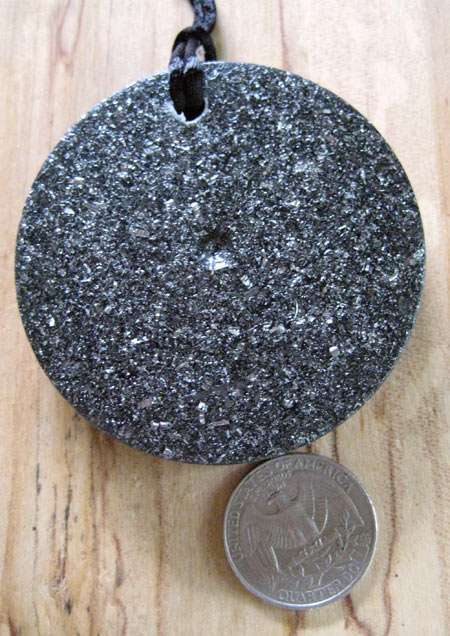 2 1/4" in diameter and 3/4" thick. Aluminum is the most used metal, light weight, and known to be quite reflective to subtle energies. Magnesium is light weight metal, and has a strong, bright energy. Bronze is an alloy of copper and tin, and thus combines the energies of both. bronze always has been popular for making sculptures, musical instruments, coins and medals. Bronze shavings; the shavings have a nice, bright golden color. Three green mineral stones in the middle. Titanium has a strong energy. Maybe this is due to its high strength and resistance to corrosion. When used in alloys, it provides great strength and at the same time it is light in weight. I have found that tungsten in Orgite has a calming and grounding effect. 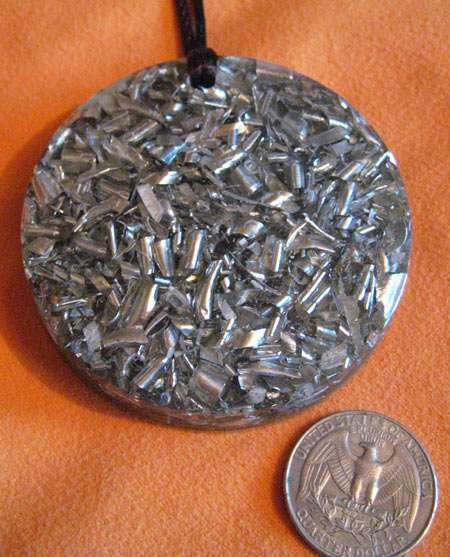 Tungsten is a hard, rare metal. It has the highest melting point of all metals. 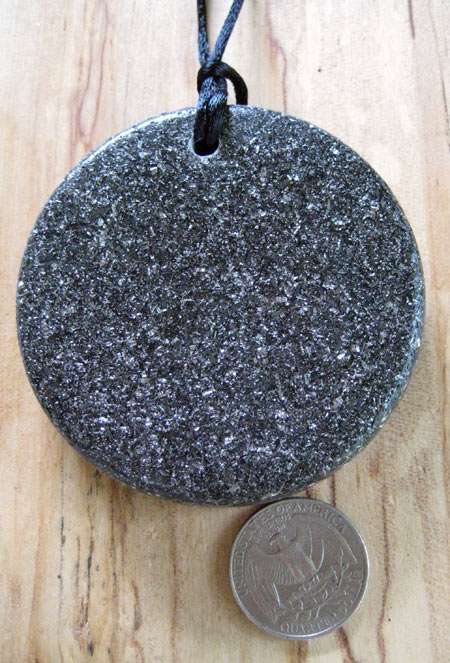 It has a very high density, comparable to that of gold and uranium, and thus is quite heavy. It is used in light bulbs because it readily converts electricity into light. It is also used to shield against high energy radiations (radio-activity). I find antimony on my Orgite pieces as being of a positive and uplifting spirit. Antimony is ruled by the Sun and the element Fire. It is primarily used for protection and strengthening. It is a protective metal and teaches the values of transformation and adaptability. It teaches of wisdom and strength that can be gained from others and also given in return. Antimony represents the free spirit, wild nature or animal power dwelling within all humans. Iron is associated with the planet Mars, and the element of Fire. In magic iron was used for its very strong projective energies. Iron nails and other objects were used to ward of evil beings, or unhealthy energies from one's home. An example of this is the iron horseshoe above a door. Iron would also draw illnesses out of the body. Iron is present in the center of the Earth. Therefore, you can use iron as a grounding tool for earthbound work and at the same time, as a universal tool for other work. Filled with fine iron particles. The chief commercial uses for selenium today are in glassmaking and in pigments. Bit selenium is also a semiconductor and is used in photocells. This is because the electrical resistance of selenium is dependent on the ambient light. In other words the available light determines the electricity flow in selenium. The heart, kidney, lung, liver, pancreas, and muscle contain very high levels of selenium as a component of glutathione. The highest levels of selenium are found in the liver. The second highest levels are in the eyes. Apparently, selenium is important in eye lens to prevent cataracts or other eye problems. Selenium is also present in some proteins. Cobalt is radiant, powerful and extremely psychically active. Cobalt is the active center of coenzymes called cobalamins, the most common example of which is vitamin B12. As such it is an essential trace dietary mineral. Vitamin B12, also called cobalamin, is a water-soluble vitamin with a key role in the normal functioning of the brain and nervous system, and for the formation of blood. It is one of the eight B vitamins. It is normally involved in the metabolism of every cell of the human body, especially affecting DNA synthesis and regulation, but also fatty acid metabolism and amino acid metabolism. Cobalt in present in the pineal gland in trace concentration. It is also interesting to note that cobalt is one of the three naturally magnetic metals, iron and nickel are the others. Although not studied yet, cobalt in Vitamin B12 might interface with natural weak magnetic fields. Because cobalt is present in the pineal gland, it might play a key role in the circadian rhythms which are regulated by the pineal gland, but it might also tie in with what is known as the third eye and its spiritual vision, and spiritual characteristics it is known for. Pendant is darker than in the picture.